"British Security in the 2020s"
Professor Michael Clarke was Director General of the Royal United Services Institute (RUSI) from 2007 to 2015. Until 2001 he was Deputy Vice-Principal and Director for Research Development at King’s College London, where he remains a Visiting Professor. From 1990 to 2001 he was the founding Director of the Centre for Defence Studies at King's. He is now a Fellow of King’s College London and of the Universities of Aberystwyth and Exeter. He has previously taught at Aberystwyth, Manchester and Newcastle-upon-Tyne, New Brunswick, and the Open University. He has been a Guest Fellow at the Brookings Institution, and a Fellow in Foreign Policy Studies at the Royal Institute of International Affairs. 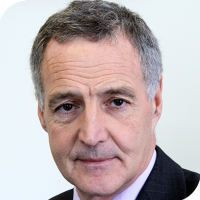 Michael has been a specialist adviser to the House of Commons Defence Committee since 1997. In 2004 he was appointed as the UK’s member of the UN Secretary General’s Advisory Board on Disarmament Matters. In 2009 he was appointed to the Prime Minister’s National Security Forum and in 2010 to the Chief of Defence Staff’s Strategic Advisory Group. In January 2016 he was appointed a specialist adviser to the Joint National Committee on Security Strategy for the period of the current Parliament. Michael is an Hon Member of the Keele World Affairs Advisory Panel.